Why not bottled water or filters? One of the main concerns with consumption water is TDS level. TDS stands for Total Dissolved Solids and represents an amount of impurities. In other words, TDS levels represent how much of the water is not H20. There are hundreds of different kinds of TDS, such as Arsenic, Lead, Fluoride and Mercury, but the government sets regulation on only about 1/3 of these. Harmful TDS can absorb into water from pollution or old water pipes. A government regulation on a TDS, or contaminate, is called a MCL (Maximum Contamination Level). This is basically the governments way of acknowledging they cannot feasibly deliver purified water to the general public. The fact that our tap water is allowed to contain contaminates, coupled with city failures on the already weak government standards, raises some serious health concerns. Even if we took Uncle Sam's word for it that a little bit of rat poison or pesticide in our water is ok, we just don't know from day to day if these standards are being met. The U.S. government does not require tap water to be healthy in any fashion. At the end of the day, your water is a question mark. Over 1/4 of municipal water suppliers in this country are in current federal health violation, according to the most recently posted federal findings. If you think you may be in a 'good area' for water, think again and have your water tested. We encourage you to do some research on your own about government standards and failures. Microbial contamination is one of the most fundamental concerns in consumption water. There are many things found in water that can pose health hazards, but bacteria, viruses, amoebas and other pathogens pose the most immediate and significant health concerns. These types of contaminates, like E. Coli, Cryptosporidium and Giardia, can be found in water and have potentially devastating effects on health. What's worse is, the government allows bacteria to be present in your water! The federal guidelines in place are so weak that they allow up to 5% of water samples taken from a municipal supply to contain coliform bacteria like E. Coli. 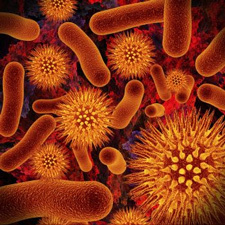 Coliform bacteria comes primarily from the intestines of mammals. In other words, when cities treat 'waste water', a.k.a. sewage, and send it back to you as municipal drinking water, some of the bacteria (and other things) are left behind. The cities typically use chlorine to kill bacteria and viruses in municipal water. Chlorine is in and of itself a poison. It is what they would consider the lesser of two evils. However, the cities still have trouble maintaining adequate microbial control. If you have ever heard of anyone receiving a 'boil alert', this is why. Boil alerts are issued because the cities have 'found out' about a microbiological contamination or possible contamination problem. In other words, they tell you after the fact. Many people in boil alert areas aren't even aware a boil alert is going on. In other words, you have to go check to see if your under a boil alert because the city might tell you. In fact, when reviewing the most recent government statistics on bacterial contamination and control failures, you will see that on average, some 9 million Americans are delivered water which exceeds federal guidelines on coliform bacterial control. Furthermore, if you are on a well water system you likely have no measure of microbiological protection. Pure Essentials is not here to scare people into water purification, but we do encourage you to do some research on your own about water contamination, particularly microbiological contamination, it's possible health effects, and government regulation and failures regarding this subject. It is a well known fact that city water contains chlorine. This poisonous gas is dissolved in water to kill bacteria and viruses. Unfortunately, not only is chlorine bad tasting and smelling , it is terrible for the human body and has also been linked to numerous types of cancers. Removing chlorine from your consumption and bathing water is a must. Chlorine gas was first introduced as a weapon on April 22, 1915, at Ypres by the German Army and the results of this weapon were disastrous. In essence, the cities are poisoning our water supplies with chlorine to try to control bacterial problems. Chlorine in water poses many health hazards. It also tends to combine with other molecules in water to form chlorine compounds like chlorites and chloramines, which can be even more harmful to your body than the chlorine itself. Pure Essentials water treatment equipment can eliminate all the chlorine from your consumption water and shower. pH is a measure of acidity. On the pH scale, you will see that 7 is neutral. A pH of lower than 7 is considered 'acidic', while a pH above 7 is considered 'basic'. 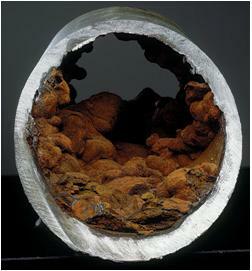 Low pH, or acidic, water can cause plumbing corrosion and lead to costly repairs. The effects of pH in your drinking water is a subject of much debate. We encourage you to do some research on your own to reach your own conclusions. We all learn in grade school that our body is made of mostly water. It is important to keep our bodies hydrated properly, but the fact is that most American's don't. It is advised that we should consume half our body weight in ounces of water every day. But it should also be the right kind of water; purified water. Dehydration has become an epidemic across America. 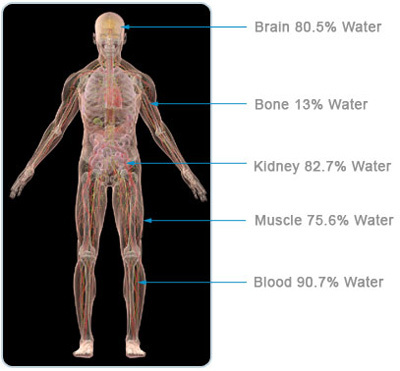 Most people don't even realize when they are dehydrated. Have you had any of the following symptoms: Headaches, Nausea, Sleep Problems, Fatigue, Cramping or Trouble Concentrating? Dehydration may be the culprit! Long term dehydration can lead to even more serious problems like: Kidney Stones, Vision Problems, Arthritis and even Organ Failure. When you have an unlimited supply of pure, healthy water at your finger tips, you will drink more of it and feel better for it! Pure Essentials has conducted water quality evaluations across many parts of Escambia, Santa Rosa, Okaloosa, Walton, and Baldwin counties. Our results show amounts of impurities, but we would need a chemistry lab to test for all the different individual things that could be found in the water. Unknown to most Americans, a surprising number of U.S. cities have drinking water with unhealthy levels of chemicals and contaminants. The website 24/7 Wall St examined the quality of water supplies in most major America cities, using data collected from multiple sources for five years (ending in 2009) by Environmental Working Group (EWG), based in Washington, D.C. The fact that the data covered a half-decade is important because it shows that the presence of certain chemicals is persistent. Test results from EWG's national database covered "a total of 316 contaminants in water supplied to 256 million Americans in 48,000 communities in 45 states." According to the data, among the contaminants were 202 chemicals that aren't subject to any government regulation or safety standards for drinking water. The percentage of chemicals found based on the number that were tested for. The total number of contaminants found. The most dangerous average level of a single pollutant. Located on the Florida Panhandle along the Gulf of Mexico, Pensacola is Florida's westernmost major city. Analysts say it has the worst water quality in the country. Of the 101 chemicals tested for over five years, 45 were discovered. Of them, 21 were discovered in unhealthy amounts. The worst of these were radium-228 and -228, trichloroethylene, tetrachloroethylene, alpha particles, benzine and lead. Pensacola's water was also found to contain cyanide and chloroform. The combination of these chemicals makes Pensacola's water supply America's most unhealthy. 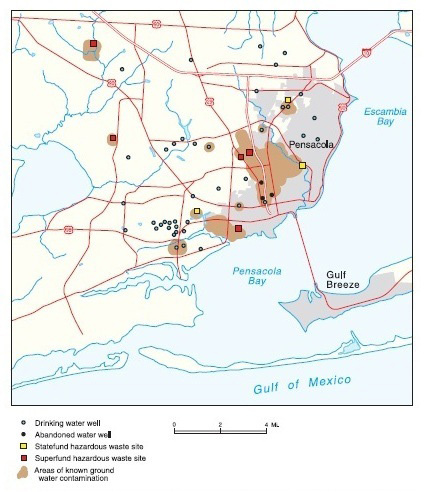 Large scale water quality study finds Pensacola, FL has the Nation's Worst Water! The EWG (Environmental Working Group) conducted a study across 100 major cities in America over the course of 5 years and found that Pensacola, FL was at the very bottom of the list. The types and amounts of contaminates consistently present in the water make Pensacola's water supply the worst in the nation. Pensacola had over 20 MCL (Maximum Contamination Level) federal health guideline failures. Please read this article MSNBC published on the results of this study for more information on Pensacola's water contamination problems. 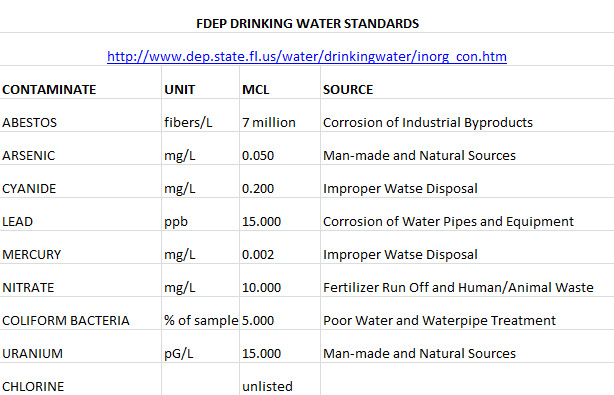 This list clearly shows that the U.S. government allows harmful contaminates to be in your tap water. Some of these include lead, mercury, arsenic, cyanide, asbestos, pesticide and bacteria. Even the weak health guidelines they have in place are being failed constantly by municipal water suppliers. We implore you to read this article and become aware of what contamination may be present in your water supply and how it can adversely affect your health. Don't rely on the government to deliver you good water. If you want it done right, do it yourself, with a Pure Essentials water purification system! This article shows just how many water quality failures are occurring nationwide and the types of these failures. If you analyze the statistics, you will see that over 9 million Americans are being delivered water with live coliform bacteria present, such as E. Coli. With a Pure Essentials reverse osmosis water purification system, you don't have to worry about what your city water supplier is or isn't doing. This article highlights yet another flaw in our government's water quality regulation. Amoebas are known to carry deadly diseases and protect harmful bacteria from the chlorine that cities use for microbial control. Please read this article. This is just one more reason to take control of your water and get back to the Pure Essentials. Americans are throwing away a staggering amount of plastic water bottles every day. These bottles do not bio-degrade and are terrible for our environment. Most people who have a concern with their tap water are buying bottled water in some fashion. Whether it be cases of bottles, gallon jugs or 5 gallon jugs for a cooler, you are certainly not alone. The fact is, there are multiple reasons to stop buying bottled water and start purifying your own water. We will try to touch on a few of the reasons we feel are most important. There are several quality concerns to be mentioned about bottled water. Primarily, there are two kinds of bottled water: 'Purified Water' and 'Natural Spring Water'. 'Natural Spring Water' basically means 'Unfiltered Ground Water'. The 'Natural Spring Water' marketing campaign would lead you to believe the water is full of beneficial minerals. Do you honestly think that's the only thing that has gotten into that ground water in the past 100 yrs. of industrial pollution and poor ground water protection? The fact is, Natural Spring Water could be anything! It could even be bottled tap water! 'Purified Water' bottled water claims to pass their water through a Reverse Osmosis process then add elements to their water to give it a distinct flavor. One problem is that even purified bottled water is stored in a plastic bottle. Chemicals in the plastic itself can leach into the water over time. These chemicals, like BPA and Phthalates, are known carcinogens. Certain factors contribute to this chemical breakdown; like direct sunlight, high temperatures and freezing temperatures. The fact is, bottled water is an illusion of purity. It comes in a bottle so you think it must be good, when in reality you don't know what is in that bottle of water any more than you know what is in your tap water. Bottled water is expensive. Anyone who buys bottled water for their family or business knows just how expensive it can be. Bottled water is a cost factor that will never go away until you make the decision to change to a better option. Think about it, how long do you plan on drinking water for? Calculate how much you spend on average on bottled water in a given month. Now multiply that number by 12 to get your annual cost. Now multiply that by 10 to see how much you would spend in a decade. Want to keep going? Probably not after you see those numbers. This is why the bottled water industry is a multi-billion dollar industry surpassing that of even soft drinks. Now think of what you got for the money you spent. Drinking water. Maybe enough to quench your thirst. Did you cook with that bottled water? Make coffee with it? Give it to your pets? Use it for your ice? Did you clean your windows with it? Did you wash your hands with it? The answer to these questions is usually no. If you tried to use your bottled water for everything, the number you just calculated would explode into a fortune. A lot of people tell us buying water is convenient because they can just grab a bottle and take it on the go. But how convenient is buying water really? You have to haul it back from the store, stockpile it in your home or office or risk running out. And when you do run out you have to go to the store again or dehydrate yourself. Do you find yourself rationing your bottled water because it's such a pain to go get more? Plastic bottle waste has become a huge pollution issue in America. 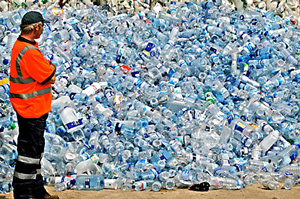 The amount of plastic water bottles thrown away every year ranges in the billions! These plastic water bottles are not bio-degradable and are terrible for our environment. The plastic chemicals leaching out of these bottles while in landfills ends up, you guessed it, back in the ground water. The only way to know for sure what's in your water is to purify it yourself. Pure Essentials reverse osmosis systems enable you to do just that. When you purify water at the point of use, there is no possibility of re-contamination, no plastic bottle waste, tons of benefits to your health and quality of life, and the best part; you save money! If you are currently using a filter for your drinking water, there is a 99% chance you are using a Carbon Filter. These filters include pitcher filters, countertop filters, under sink filters, faucet filters and refrigerator filters. Carbon Filters, aka charcoal filters, are mostly designed to remove chlorine. This does make the water healthier and better tasting, but does not do everything you need. Carbon filters don't purify. In other words, they don't remove dissolved solids or microbiological contamination. Pure Essentials reverse osmosis systems (also called hyper filtration) purifies water down to 0.0001 microns, which does remove dissolved solids and microbiological contamination. Remember, filters don't purify, reverse osmosis with Pure Essentials does! Bottled water, carbon filters and lesser quality reverse osmosis systems simply can't compare to treating your water with a Pure Essentials point of use water reverse osmosis purification system. There are limitless benefits associated with making purified water a part of your life. To name a few: Drinking, Cooking, Beverages, Ice, Pet Water, Nursery Water, Plants, Cleaning and much more! Your foods and beverages will not only taste better, they will be much healthier for you! Ice cubes made with pure water are crystal clear. Pets prefer purified water over chlorinated tap water every time! With up to 50 gallons per day of purified water at your disposal, you won't have to worry about running out or conserving the water. On the contrary, the more liberally you use it the better! Think of all the things you use water for on a daily basis. Now think of all the advantages of having 50 gallons of purified water at your disposal every single day for the rest of your life! With Pure Essentials, you can! We always encourage individuals, families and businesses to do some research on your own about water quality and water treatment. The more you know, the more you know Pure Essentials has the best products, services and prices available. Please contact us at 850-637-4245 for more information about reverse osmosis technology or how we can help you enjoy purified water for life! If you are experiencing problems with our site, please click here.